Hempstead resident, Scott Hajovsky set up a fishing trip, Thursday, May 28th with some friends. They met up at Eagle Point, Galveston Bay around daybreak. The weather was fair with moderate winds. After a week of rainstorms, the water was so fresh that the bait camp was adding salt to the tanks. They managed to get some live shrimp and croaker, then launched the boat, headed to their first fishing spot, dropped anchor, and casted there bait assortment. Fishing was slow. Hajovsky only managed to catch and release an undersized trout and lose an undersized flounder at the boat so the friends decided to head across East Bay in search of clearer water. The next fishing spot looked more like chocolate milk and yielded no fish, so they decided to head southeast to a more attractive spot where the water condition was better. The sun started to encroach on high noon as they dropped anchor to give it another try. The bait was slowly starting to die from the lack of salt, but worked in one of Hajovsky’s friend’s favor loading the boat with black drum. Hajovsky managed to catch rocks and snap lines, while his friend continued to pull in the fish and talk smack. Hajovsky finally hooked up and got a fish to the boat, but it turned out to be a rat red. Meanwhile, the other friend caught a black drum, a slot redfish, and a stingray while Hajovsky spent his time getting hung on rocks now listening to both fishing buddies talk smack. Hajovsky figured his under-sized “Texas Slam” wasn’t going to win the smack talking war, so he dug out the last live shrimp and casted it out. He got a bump and the rod bent over. As Hajovsky reeled in, he had high hopes of redeeming himself with this catch. As the fish surfaced tugging along the side of the boat, he noticed something sticking out of the back of the fish. Hajovsky never would have dreamed of such a fine redemption! He then realized what it was and exclaimed, “It has a tag!! !” Panic ensued, there was a scramble for the net, but teamwork helped safely land the fish in the boat. The celebration commenced and the friends expressed their congratulations. Hajovsky remained humble until he figured out what had just happened. “What a redemption made possible by CCA Texas and the STAR Tournament… let the smack talking begin!” said Hajovsky. 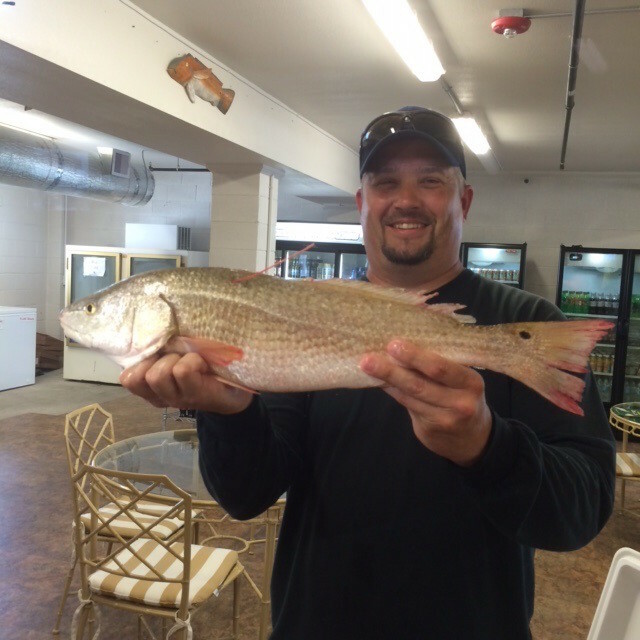 CONGRATULATIONS TO OUR FIRST TAGGED REDFISH WINNER! Fortunately for Scott Hajovsky, he was registered and is now the lucky winner of a 2015 loaded Ford F-150 “Texas Edition” XLT SuperCab, pulling a brand new 23’ Haynie BigFoot boat rigged with a Mercury 150L Pro XS OptiMax motor and Coastline trailer prize package, which will be awarded to him at the STAR Awards Ceremony in October. So far four tagged redfish have been caught, but only one confirmed as a winner at this time. That means there are fifty-six tagged redfish still out there swimming and four truck/boat prize packages still available to win! Trophy-sized prizes can be claimed by STAR anglers who bring in the first 10 tagged redfish. The first five winners will drive home in a 2015 Ford F-150 “Texas Edition” XLT SuperCab, 23’ Haynie BigFoot boat rigged with a Mercury 150L Pro XS OptiMax motor and Coastline trailer The next five tagged redfish winners will each claim a 23’ Haynie BigFoot boat with a Mercury 150L Pro XS OptiMax motor and Coastline trailers. For young anglers not of legal driving age who reel in the famous tagged red, he or she will receive the boat package plus a $20,000 college scholarship, in lieu of the truck.